“C is for cookie, that’s good enough for me! Oh! Cookie, cookie, cookie starts with C!” Heard this song? Anyone? Anyone? Well, whether you are familiar or not, the Cookie Song is sung a lot around our house and my children have found an uncanny way to gravel their voice just like Cookie Monster. I must announce, however, that the song was taken to new heights of excitement with these Heath Bar cookies. My four little rascals were dancing around the kitchen, cookies in hand, shouting the lyrics and praising my name (love that!) for making these beauties. 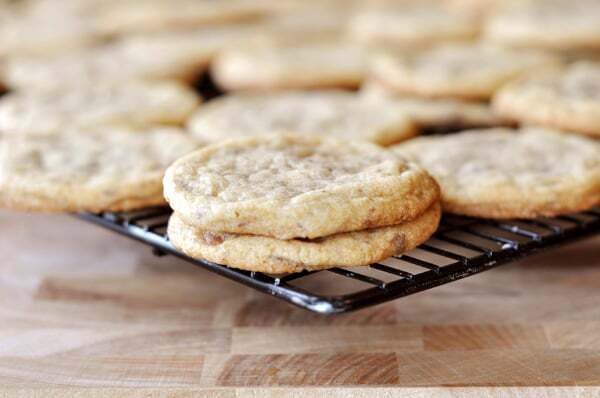 A thin, buttery, chewy cookie, these Heath Bar cookies are deliciously nutty and filled with toffee bits. I think next time I may even throw in a sprinkling of mini chocolate chips to kick things up a notch. I loved that these cookies are a bit different in texture than some of my much-loved thick and soft cookies. Delicious in their uniqueness, these will be making repeat appearances, if only to let my children practice their Cookie Monster impersonations over and over and over. In a medium bowl, whisk together the flour, salt, and baking soda. Set aside. In a large bowl (or the bowl of an electric stand mixer), with an electric handheld mixer, beat together the butter and sugar. Beat in the eggs and vanilla and mix until the mixture is very light in color and creamy. Add the flour mixture and stir to combine. Once it is about halfway combined, add the heath bits and mix until all the ingredients are mixed together. Chill the cookie dough for 30 minutes to an hour. Preheat the oven to 350°F. On cookie sheets lined with parchment paper or a Silpat liner, scoop the cookie dough into about 1-inch balls. Place the dough about 2 inches apart on the cookie sheets (these cookies have a bit of spread to them!). Bake for 10-12 minutes, until the edges are just starting to brown. Remove from oven and let the cookies cool for a few minutes on the baking sheet. Transfer the cookies to a wire rack to cool completely. This recipe requires chilling the cookie dough for at least 30 minutes, so plan ahead! Love your blog! I baked these cookies yesterday and they were delicious, but my family agreed that they were quite greasy and flat (the dough was WELL chilled). Do you think either cutting down on the butter just a bit, or adding a little more flour might help? Hi Joni – these cookies do tend to be on the buttery/thinner side of things but certainly trying either of your suggestions might help. I haven’t tried them so I can’t say for sure but you could play around with it. I can imagine myself making those same sounds while eating several of these because I’m sure I could not stop at one! We took these to two parties and they got great reviews! I did add about 1/2 cup more flour to get rid of the “spreadableness” and then I cooked them for 9 min. (for the cookies being eaten that day) and 8 min. for cookies eaten later. They stayed so moist! My family is devouring a batch of these as I write this. So, so good. 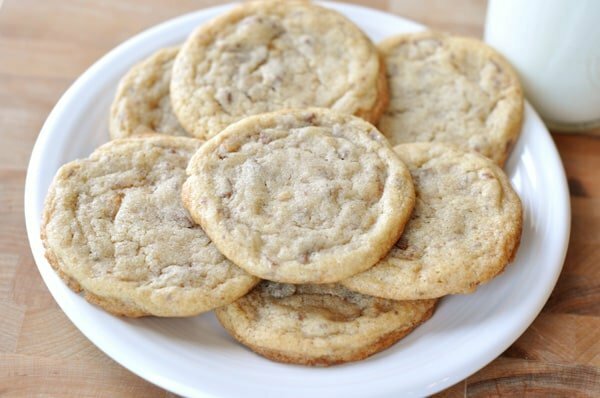 I have been making this recipe for a few years now and everyone loves these cookies! I have added the mini chocolate chips before- great both ways! All I can say is OMG!!!!! These were fantastic. I used the bag of heath milk chocolate english toffee bits..so easy! These wont last long!!! I have never used parchment paper for baking and I wonder what cave I have been hiding in!! What a difference in clean up and no stick! Wonderful!! Thanks for sharing!!! tried these out this afternoon, although I must admit, I also mis-read the name and thought it said “Health bar cookies” . After reading the whole recipe I decided to make them anyway. Didn’t have quite enough candy bar pieces, but still turned out wonderfully! Mel, you are killing me! How could you tempt me with Heath cookies when I’m trying to eat healthy??? Where’s the consideration here? You owe me one. How bout’ you come up with an amazing cookie that doesn’t contain white flour or sugar? Come on. . . you know you can! In the meantime, I’ll just dream and drool!!! 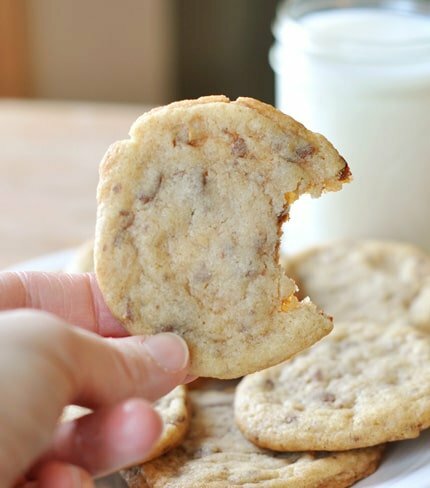 I love toffee in cookies and this chewy version looks delicious. Melanie, I thought this said ‘Health Bar Cookies’….I was trying to figure out what was so healthy about a cookie, cause you know if I consider them healthy I might eat a few extra! 🙂 Anyways, I love Heath Bars, I’ll be trying these shortly. K, my hubby sings that song all the time, and I did not realize it was from Sesame Street! I had an underprivileged childhood apparently! I hope to make these soon! Ohhhhhhhh! Heath Bars are my all-time favorite! Can’t wait to try this! HA That’s my favorite sesame street song!!! I myself dance about the kitchen singing that song whenever I make an especially tasty cookie…ok fine whenever I eat a cookie, even a bad one LOL!!! I LOVE Heath Bars! I am making these for a party this weekend! Your boys are adorable, Melanie! I can just imagine them dancing around singing the cookie song! Too cute! These are my family’s very favorite cookie. We just polished off a batch last week. They are definitely better made with the candy bars. You get bigger chunks of toffee. I’ve made them with the toffee bits and mini chocolate chips as well. Those are good, too… but you get more chocolatey flavor than you do when using the candy bar pieces. 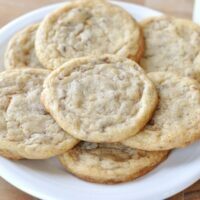 The Heath Bar cake was a big hit…Can’t wait to try these cookies. Yum-o!